Placitas (zip 87043), New Mexico gets an average 11 inches of rain per year according to Sperling’s Best Places (www.bestplaces.net). The U.S. average is 37 inches. Snowfall is just 12 inches per year, whereas the average U.S. city gets 25 inches of snow per year. Most Placitas residents obtain their residential water from neighborhood or private wells. Some properties in the Village of Placitas have water rights to the Las Acequias de Placitas, the village ditch system fed by springs and held in ponds above the community (ref: lajicorita.wordpress.com). Gardeners and farmers in Placitas need to conserve precious well and acequia water. When there is rainfall it may not be enough to soak the ground, or it may occur too quickly (i.e. in the monsoon season) and in greater volume than what parched soils can absorb. According to the Office of the State Engineer, 54% of water usage for single family residences is outdoor watering. The percentage of use for agriculture watering is even greater. Rain Water Harvesting is the collection, storage and diversion of rain water from a surface for later or delayed usage. Both active and passive options of rain water harvesting exist. Rain Water Harvesting is a relatively easy way to supplement ground water and acequia sources of irrigation. It is also legal in New Mexico. The active mode of rain water harvesting consists of collecting roof water run off into storage tanks for later usage for watering landscape plants. Active rain water harvesting systems can be simple or complex. 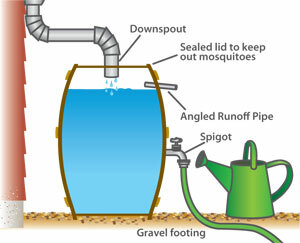 Simple systems consist of a rain water barrel positioned under a canale with a spigot inserted at the bottom of the tank for draining. Complex systems utilize large collection tanks or cisterns, guttering pipes, first flush diverters, filters, pumps and automated irrigation hook-ups. The passive mode of rain water harvesting utilizes landscape features such as down slope berms, dry creeks, French drains, and basins to slow and route irrigation and rain water to planted areas. Hard surfaces such as drive ways, parking areas, and patios also work well as rain water catchment surfaces with subsequent runoff to adjacent planted areas. The terracing of steep slopes, along with planting shrubs and mulching is a passive form of rain water harvesting that slows water flow by provides water containment for the plants. The history of rain water harvesting goes back to the beginning of civilization and farming. Anasazi Indians and pueblo farmers utilized slopes and natural terracing of the land to plant crops to take advantage of landscape water flow. Cisterns were a common site in towns in the early part of the twentieth century prior to municipal water systems. The older style elevated and in-ground cisterns can still be seen in rural areas. There are advantages to rain water harvesting beyond just conserving well and acequia water. The water collected is free, and relatively low in salts. Rain water reduces erosion by slowing or stopping run-off from structures and landscape. HOW MUCH RAIN WATER CAN I COLLECT FROM MY ROOF? A significant amount of rain or snow melt water can be collected from a roof or flat catchment surface, and collection tanks and/ or cisterns should be sized accordingly to store the volume of water calculated. 2000 Square Feet Roof Results in a Water Catchment of 14,880 GALLONS/ YEAR! 3000 Square Feet Roof Results in a Water Catchment of 22,320 GALLONS/ YEAR!